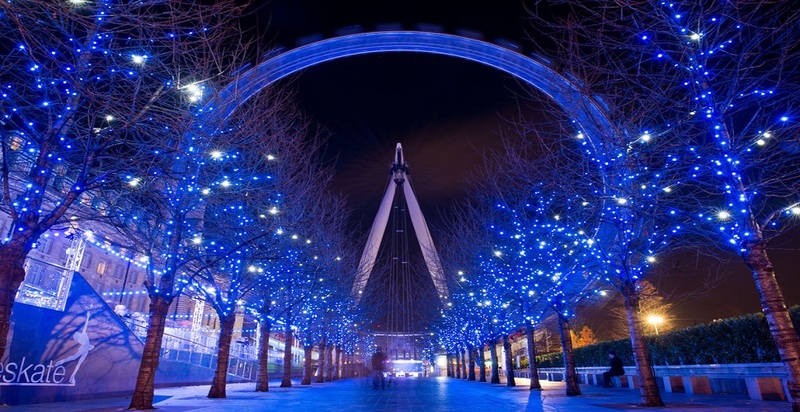 On the 12th day of Christmas, London gave to me…..
He’s behind you! No he’s not! A long-standing British festive tradition is to enjoy a pantomime show at your local theatre-suitable for all ages! In London you’re spoilt for choice with everything from Aladdin, Sleeping beauty and Mother Goose showing throughout the season. Enjoy mince pies and mulled wine whilst watching the Christmas Bauble Dash at Spitalfields Market- A 2km dash were participants dress as giant baubles and raise funds for cancer. No one says “SANTA’S COMING” quite like Hyde Park’s Winter Wonderland-and maybe Buddy the Elf! The festive extravaganza is back for 2014 and entry is FREE. For those of you who are feeling a bit adventurous, lace up your boots and enjoy the magical ice skating rink right in the heart of the city at Broadgate. Walk from the campus to Liverpool street station and follow the signs… they even accept NUS cards! Carol singing is a great way to spread the festive cheer and London doesn’t disappoint with its offerings. They can be heard everywhere from Westminster and St Paul’s to Trafalgar square, local churches and at charity fundraisers. If the stockings are still empty and under the tree is looking a little bare, it’s time to do some festive shopping. You can find all the big department stores on Oxford Street, including Selfridges, Debenhams and John Lewis along with other high street stores. If our number 6 has left you counting the pennies, visit Covent Garden on a Saturday afternoon to see Rudolph himself prance around (we couldn’t resist) the square for FREE! Ever wondered how previous generations celebrated the festive season? The Geffrye museum is offering a magical glimpse into how Christmas has been celebrated in English middle-class homes over the past 400 years. The Southbank Christmas market provides a nice atmosphere for a leisurely afternoon walk. Enjoy the abundance of hot treats on offer including burgers, hotdogs, roasted nuts, mulled wine and hot chocolate. For those who like to stay active in the cold months break out the angel wings and staffs and enjoy a 5 or 10k run all whilst raising money for a good cause. We want to hear if you try any of these, or if you have any suggestions of your own! ← Being a student in London and still having money!